Style yourself with this elegant and contemporary bracelet that features a distinctive knot in the centre, and crafted with 9ct yellow gold. The bracelet is secured with a bolo fastening, allowing you to easily adjust the bracelet to the length and look that you need. 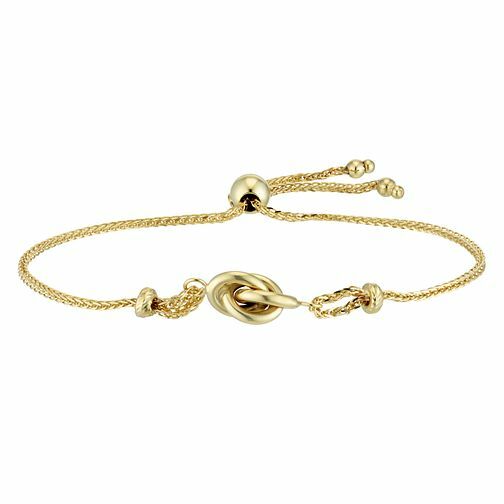 9ct Yellow Gold Knot Adjustable Bracelet is rated 4.7 out of 5 by 3. Rated 5 out of 5 by Anonymous from Quality Finish Very nicely polished 9ct gold and beautifully assembled. Rated 4 out of 5 by Anonymous from Pretty piece of jewellery Lovely bracelet. Good quality. Got a good discount so even better.